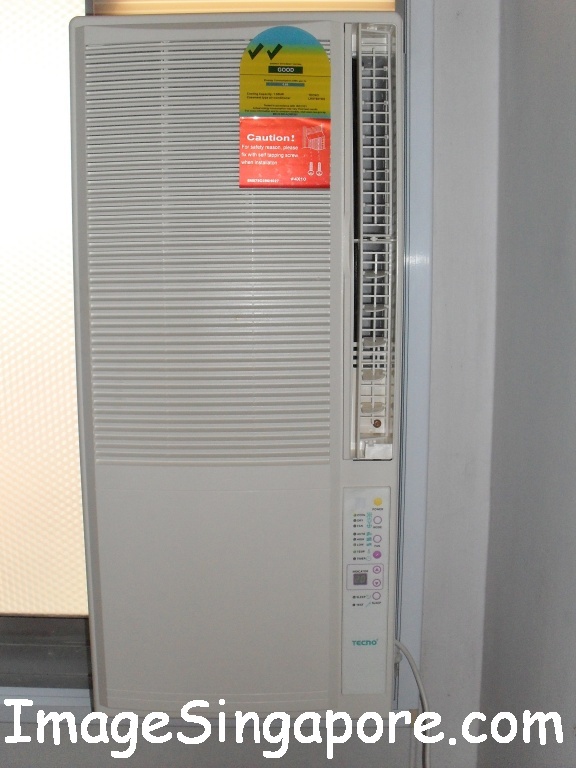 I think casement window air conditioners are more commonly used as compared to the Portable air conditioners. The Tecno Model TAC 0788YRS casement window air conditioner which I have bought has a cooling capacity of 7,000 BTU or 1.88KW cooling capacity. It has a 3 fan speed with remote control and also a 3 mode selection – cool, dry and fan. There is also a sleep timer mode included. To be honest, I was slightly worried that this air conditioner with a 7,000 BTU may not be sufficiently powerful enough to cool my small study room, but I bought it based on my observation that other similar brands such as the popular Sanyo Model SAC-88G casement window air conditioner has similar 7,000 BTU cooling capacity. 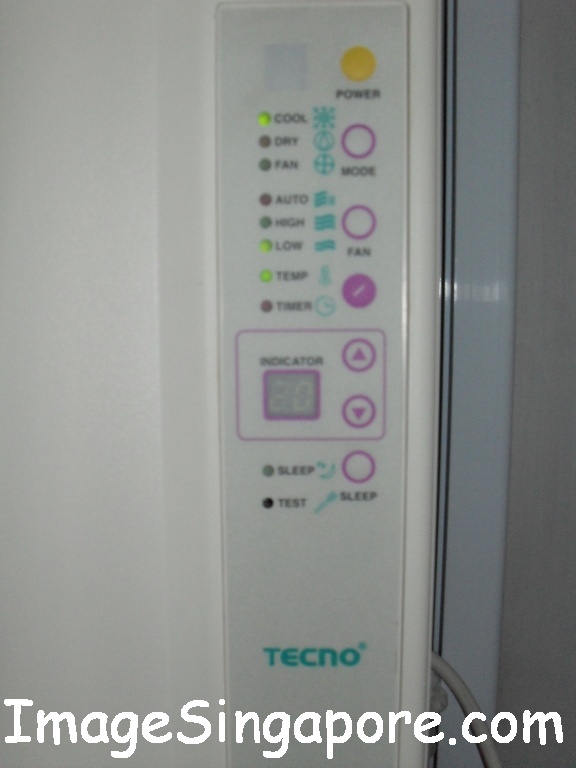 The Sanyo model cost more than the Tecno brand but in terms of energy saving efficiency, the Sanyo casement window air conditioner has one tick, whereas the Tecno brand has 2 ticks – so that was another reason why I bought Tecno. The technician came down in the afternoon to install the window casement air conditioner. The first thing that he did was to install the window frame onto the sliding window. Once the frame was up and firmly attached to the frames of the window, he carried the air conditioner and attached it to the slot of the frame and screw it tightly with a portable drill. Upon completion of the installation, he turned on the air conditioner with the remote control. The casement window air conditioner start up and air flowed out of the duct. I noticed that this air conditioner is much quieter than the portable air conditioner; perhaps because the compressor was outside the window. It took about 3 or 4 minutes before the air became cool and more importantly I could adjust the temperature lower to say 20C; unlike the EuropAce portable air conditioner which was fixed at 24C. It took about 15 minutes for my study room to feel cool and I mean really cool. I was pleased with my purchase of Tecno casement window air conditioner as it cools my study room and it is much quieter. 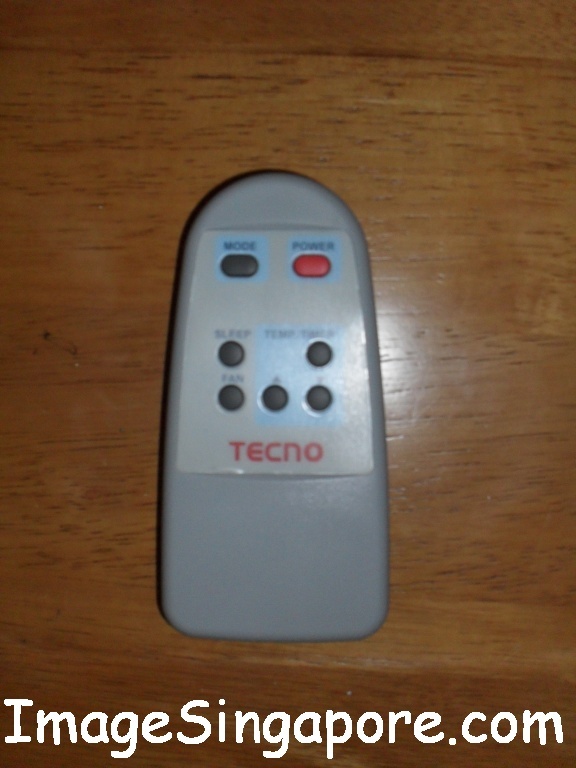 The disappointment for this Tecno air conditioner is the remote control which looked cheap and dull. The design of this air conditioner is not as nice and cool looking as compared to the Sanyo casement window air conditioner. For me, so long as it is cool and quiet, that is all that matters.